Have you been looking to buy a backpack that is durable and yet light weight? This is a long overdue post so I’m quite excited to share with you one of my favorite pieces of ultra-light gear. Go Lite Jam 70 was a pack I discovered at least 10 years ago. The pack presents itself as unassuming but overtime its owner will realize how much value it provides on the trail, no matter where you adventure. Looking back at Mt Meru on the Northern Circuit trail torwards Kilimanjaro. Day hiking towards Everest Base Camp in Nepal. Off the beaten path in China's Yading Nature Reserve. My Go Lite Jam 70 can withstand various weather conditions - from the treks I did in Nepal, Peru, Mongolia, South Africa, Philippines, India, Tanzania and plenty more. Adventuring with it proved to me that it's an all-around pack that can handle snow, rain, heat, and cold. Despite it’s light weight, it can carry up to 40 pounds. When I trekked in Sierra Nevada's Rae Lakes for 5 days, I crammed in 37 pounds, which is beyond the suggested weight for my size. Sure, the pack was a bit taller than normal and could be slightly off in terms of its size, but it still held up very well as I climbed up and down over 14,000 feet in total elevation. The pack performed well. No tears or damage to it with that much weight. Over a 6 day trek in Drakensberg, South Africa, Go Lite was as tough as the terrain. I have two versions of my pack - one I bought 10 years ago; and one that I bought about 6 years later. I still use both of them when I travel and trek worldwide for my social enterprise that requires me to travel to and from cities and trek on mountain trails. They have lasted me a while and so I continue to use them for day hikes and multi-day treks. One thing that attracted me to this pack is its versatility. It has 70 liters in gear capacity but because of its minimalist design, it can be used as a day pack without the bulk! I love that feature because oftentimes when I'm traveling globally and I have to go sightseeing, a bag that can double up its use means not having to bring an extra bag; and therefore less weight to carry around as I move quickly through my itinerary. It wouldn't be minimalist if it's heavy to begin with. Go Lite Jam 70 weighs a little over 2 pounds. That’s a good thing because you can focus your weight on the items that you need on the trail. One thing I didn’t like about my prior packs is how much weight they took up to begin with. Knowing that the ideal weight is one fourth of my body weight, it means I have to be mindful of the items I’m carrying with me so I don’t go beyond the ideal weight. To have a lighter pack would means being able to add extra water or snacks or whatever gear I wish to add to make the trip more pleasurable. I also ended up investing in a much heavier sleeping mat as I can afford to do so because my pack is so light to start with. At first, I was skeptical as to whether its simple design can serve the purpose I'm looking for with my kind of adventuring. As one can notice easily, there are only two openings on this bag: a top load drawstring opening and a zipped front pocket. There are two side compartments on the waist strap for small items such as ID card, but nothing more. Additionally, there are side pockets for water bottles, or in my case, my tent! Prior to this pack, I had a few bags that were dotted with so many compartments. They were fun to use but the weight of these compartments soon became more of a burden; hence, convincing me to look for a lighter pack. After years of use, I have grown accustomed to the minimal compartments of Go Lite Jam 70. In fact, I realized one doesn't need THAT MANY compartments. The lack of compartments actually taught me to be a better organizer via using an efficient approach to sort out my gear items rather than relying on the bag itself to sort my items for me. Because I only have one major compartment to contend with, I learned to be efficient and divide up various items (food, electronics, toiletries, clothes, etc) in various dry sacks. I pack the sacks in a methodological fashion where heavier items and lesser used items are packed in the bottom while light weight and frequently used items are placed in the top portion of the pack. To me, the lightness of the pack was more important than the convenience one would find in having numerous compartments. The zipped compartment in the front is sufficient for the small and frequently used items. In the end, the number of compartments on the Go Lite are all you need to get organized. 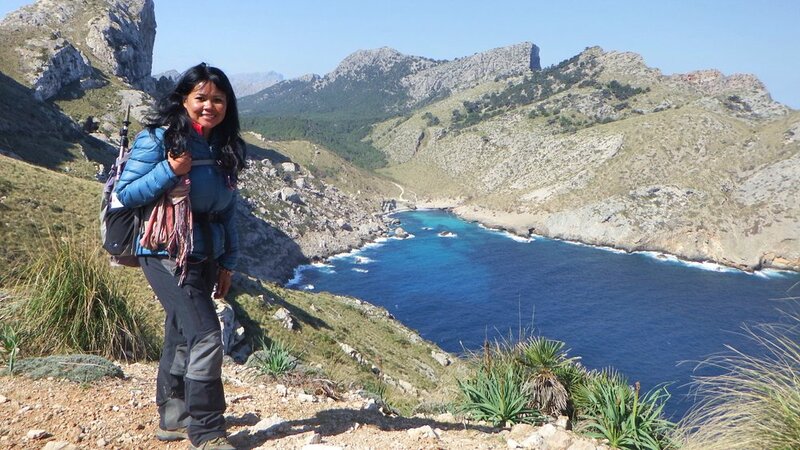 Coastal hiking in Mallorca, Spain. Taking it on the trail to Roraima, Venezuela. As to water compartment, you'll find that the inner pouch is suitable for bladders up to 3 liters in volume. Anything more than that amount can be problematic. Although a bit tighter and slimmer than other packs, the compartment gives you enough room to fit in up to 3 liters of water. However, the side pockets can be utilized for your Nalgene bottles. In my case, I even use it as a place for my tent as it is wide enough for it to fit. It’s unisex and yet suitable to a petite, short hiker on the curvy side. As a female who is 5’1 in height, I needed to make sure the pack I use is not overwhelmingly tall or big that it would cause weight distribution to be problematic. The pack comes in various sizes (S, M, L) which catered to what I was looking for. After the introductory period of use, I noticed quickly that the pack fit my body structure like a glove. What are some imperfections about this pack? 1. One noteworthy disadvantage with the pack is because of its very lightweight and thin straps, you have to be mindful of how much weight you put in it and how you pack your items. At times, if you don't pack your items correctly, the weight distribution can easily be off balanced. 2. Your body will have to carry the weight itself. It may require a strong core to be able to handle carrying your items in this pack. The straps are the thinnest I've ever seen in the market. Don't underestimate this though as the straps provide enough support to allow me to carry the weight using my core. For those who may not be in decent shape, it can be a challenge but with practice, you will soon grow accustomed to the design and shift in terms of the weight. My two Go Lites back to back as my home (in Kotor, Montenegro). Having said this, remember that no pack is ever perfect. You will need to choose what’s best for you. This means prioritizing what is the most important to you as an adventurer on the mountain trails – that can be the weight, design, functionality etc… of your pack. You will have to make that decision and from there find the product that fits the criteria you have chosen. The reality of it is that it’s unlikely to get all the features you want (unless you invent your own pack or pay someone to design it for you) so be ready to sacrifice certain elements over those that matter to you the most. Either way, choosing a pack requires a learning period. If your first pack doesn’t work out, just keep looking and soon enough you’ll find the one that matches your needs. In my case, it took me at least 3 years to discover Go Lite Jam 70. It’s still not the perfect pack and I’m sure open to trying out other brands and models. After all, many outdoor companies continue to create better designs for women when it comes to backpacks. For now, Go Lite Jam 70 will always be my favorite minimalist, ultra-light pack for my globe trekking needs - the home I knew best for the year I went away solo trekking in 21 countries. Now that I have shared with you my overdue review on this gear, I do need to note that Go Lite was acquired by another company called My Trail Co. The company name has changed but the gear remains the same. Go to My Trail Co to purchase yours. This is a non-sponsored review of Go Lite (now My Trail Co.) product. No financial or in-kind compensation was provided to the reviewer.